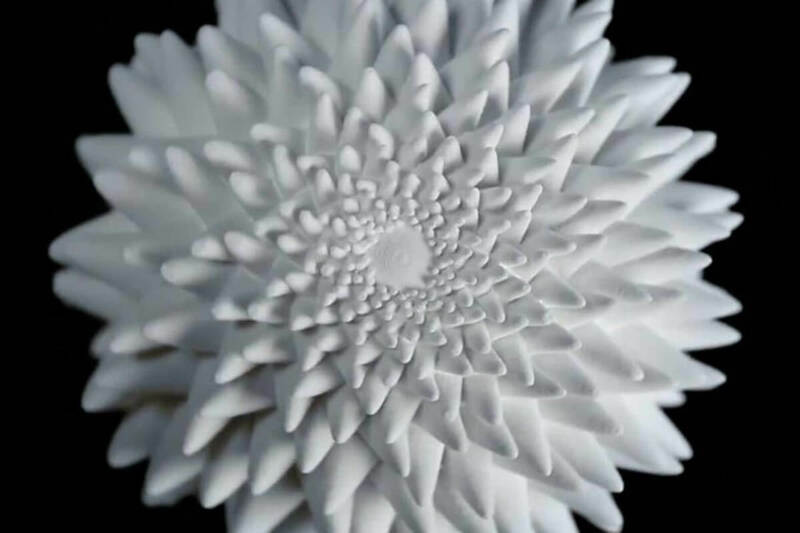 With a tessellating texture and self-moving body that hops into action as if balanced on a turntable, an elegant 3D sculpture dazzles with its pristine mathematical design. Engineered by the technically-deft John Edmark, the artist and hyper-learned student of mathematics, the mesmerizing abstract contraptions come to life in BLOOMS 2. The new sculptural offerings are a riff on a previous design—the original BLOOMS, whose smash-hit video currently stands at 10.4 million views on Vimeo. Behind BLOOMS 2’s technology is an unexpected activation tool: strobes. The self-contained sculptures begin animating shortly after beginning to spin, when exposed to a strobe light. Edmark notes, in the video description, the significance of the golden ratio, or mathematical entity phi, Φ = 1.618033988749895…, known as the value found in nature that forms the spirals of pinecones and sunflowers. Visit Edmark’s website, here and follow him on Instagram.